I got the engine running today. The wooden propeller from the 532 wouldn't fit, so I started off with my new 68" Kiev three blade propeller. The instructions said that the starting point for a 582 should be 11-14, so I set it at 12. The old 532 Tachometer seems wildly off, so I have connected up a Tiny Tach. I warmed up the water temperature, increased throttle to get the EGTs up and then pushed it up to wide open throttle, but only got to 3400 RPM. I am running a 2.58 gear box. I am not sure if it is the throttle assembly or the propeller that is giving me the issue. So can anyone provide at least some idea of what pitch should be used? I tried the test twice and still need to break in the engine. I am currently running the gas at 100:1 in addition to the oil pump as recommended by Rotax in the 582 installation manual. I wrapped it around both plug wires for a single cylinder and set it to 180, which is supposed to be for to sparks per revolution. Since I am rebuilding this plane, am not used to a 582, I am not sure what 6800 RPM should sound like, but the engine doesn't sound stressed to me. I currently have the tiny tach wrapped around both just below the forward mag. I thought this could be the issue yesterday, so I removed it and wrapped around a single plug wire closer to the plug and was reading the same RPM. Additionally, I currently have it wrapped five times, because I read, I believe on this site to shoot for five, but according to the instructions, it said three to four times, so I tried that, also without any change. I had everything blocked when I tested...I have a guy with an optical tach coming out today and will see what it is actually turning at. I am just hoping that I haven't done any damage if it is the tach that is the issue. I did two warm ups / full power tests based upon the tiny tach, so, if this is the problem, I would have warmed the engine up way too quickly. I guess we will see. Well, verified the tach. I had to back the prop back down to a 3 to make RPMs, but have it in the 6400 - 6500 RPM range now. The Kiev instructions suggested a starting point of 2-4 for a 503 and 11-14 for a 582. Think I will go do the break in on the 582 now and maybe I can get ahold of the prop guys and the engine guy to figure out exactly what this means. I am afraid that it means that my "new" 582 is making closer to 50HP instead of 64, but we shall see. 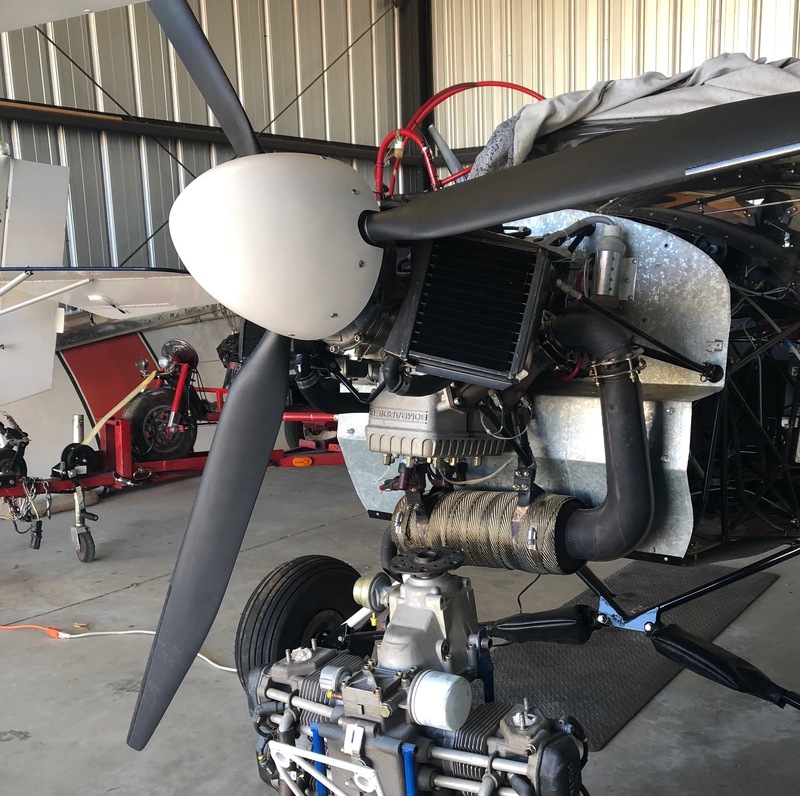 Just a FYI, as the subject has been well covered before.Dont be tempted to fly a 2stroke If the prop is under pitched,make sure your revs are actually what the tacho says. A fine pitch and a cool day can send your EGT's into meltdown territory,If you ever experience this,a little choke will drop the temps enough to get you safely back on finals.A little much pitch will just mean the engine isn't producing the maximum power,possibly the safer option? I am set at 6100 (static) and it works great. If you havent dont it yet, manually verify your gearbox ratio. Whats is stamped on the outside isnt always what is on the inside. My question is actually about what setting you used on the protractor. What are the EGTs at wide open throttle? This will tell you A LOT about how the engine is loaded. If you have the proper jets per the chart and your only getting EGTS of under 1000-1100 you have too much pitch in the prop. Watch them in the mid range as well. On a 2 stroke you really need to be able to correlate the RPMS and EGTS to get a better picture of how the engine is being loaded. I would turn the idle up a little as well unless you running a clutch. If you have a clutch then your golden at 1400 or so RPM at an idle. If you dont then you need to get the idle above the point that you have that nasty gear box chatter and vibration. Dropping down a jet size on the idle will help you as I dont know of an engine that has ever burned down at an idle. The EGTs got up to 1200. My issue is that the directions for the prop indicate that a 582 should start at 11-14 and a 503 should be between 2 and 4. Since the prop is set in the 503 territory, I am wondering what that says about how much power the engine is making. That is why I am trying to find anyone else who has this prop installed and attempting to find out what they have the prop set for with the protractor. If they got up to 1200 I would say you need more pitch. Set it for around 61-6200 static otherwise you are going to have run away EGTS when that prop unloads as soon as you start rolling. Run the break in procedure then go from there. I would target 1100 on the EGTS and make sure the water temps dont go over 180 or so during the break in. Final pitch will be set once you start flying and figure out what it likes in the air. I keep mine around a MAX of 6500 once I start rolling and on climb out. Anything more than that and your falling back on the Tq curve and just beating the air. Just built and got a/w cert in October 17. Installed Warp Drive 3 blade composite prop. Set Pitch at 16.5 degrees, static of 6300 horrible first test flight. Just barely flew the pattern and landed. Re adjusted pitch to 15 degrees and static of 6500. What should I expect of next flight? Any thoughts ? Thanks and any help is surely appreciated. Can you elaborate on "horrible first test flight?" Wouldn't climb? Over revving? High EGT's? If it was that scary in performance you have something really wrong. Prop pitching has been discussed in depth lots of times but the general consensus is that static RPM with a two stroke is a poor indicator of what you will get in-flight. My best settings give me 62-6400 during a 55mph climb out. The 582 goes flat above 6500 rpm. I've pitched mine for every 100 rpm from 6700 to 6000 in the climb and 6300 gives my airplane the best combo of climb/cruise. Next question what are you using for a tach? Needle tachs fed by the grey wire off the lighting coil are notoriously inaccurate and have caused many people lots of headaches in tuning and performance due to not turning nearly the RPM they thought they were. My last one was 1000 rpm off at WOT. A $50 tiny tach is worth it's weight in gold. Congrats on getting to the test flight phase. EDIT: Jim and I were typing at the same time it looks like. Seems I remember people starting with 13 ish degrees on the warps. Were your EGT's really low like 900-1000 degrees while wide open? the plane would not climb, maybe 200 fpm, felt like near stall, rpms at 6000 using tiny tach. had static of 6300. I thought rpms would increase when in the air. The aircraft had a definite shudder like it was going to stall. Finally got near pattern altitude and landed. Only difference between 1st and third flight was the prop and adjustments to take slop out of aileron mixer box. Still looking for help. thanks all. Maybe time to run through a whole checklist. Something is NOT right! I hate to even ask this but is there any chance your blades are in the hub backwards? It sounds like you are not making thrust. At wide open throttle in the chocks it should be rocking and rolling and trying to fly. Avid's don't shudder before a stall like most planes. Is it smooth during static ground runs? What's your CG at your flight test config? How did you rig the flaperons? I'm just throwing stuff out and certainly not trying to insult your intelligence. You should not be seeing this poor of performance without something big being out of whack. Below is a 3 bladed tapered tip warp on my MK4 for a reference. After doing the one hour break in, per the 582 manual, I was set up for WOT in the air at 6800. My EGTs would be fine during the climb, but were running a bit hot in cruise. If I increased pitch, the EGTs would drop again. I surmised from this that the engine wasn't being loaded enough, so I reduced my WOT maximum RPM, in the air, to be at 6500, which was around 6100-6200 static and this seemed to help. I currently climb out at 6000 RPM, which is about 62mph and am getting 1200-1300fpm climb. I generally cruise at about 5800, which nets me around 82-85mph, unless I am just out messing around, in which case I will run it closer to 5600, which nets me 78-80mph. You should know that I have parts from A, B and C models, although the data plate indicates a B model. I have the narrower fuselage and just under a 24 foot wing span, so these numbers would be fairly subjective unless you have a similar setup.